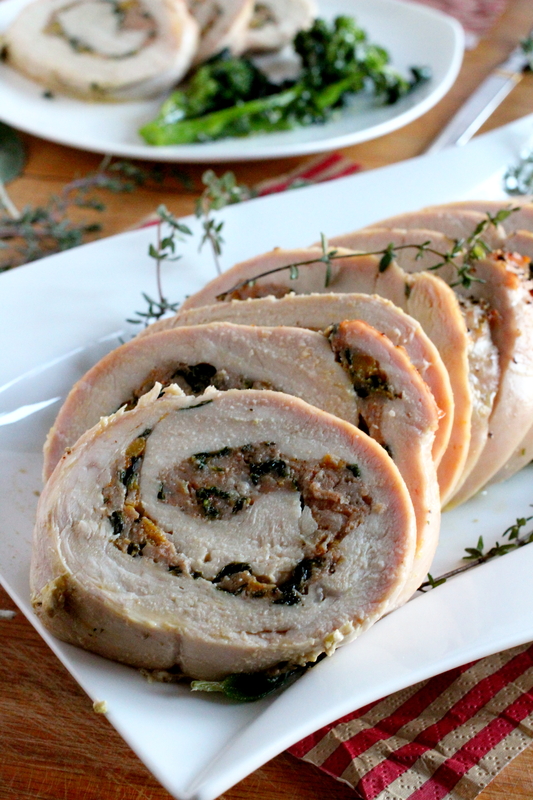 Easy Roasted Turkey Roulade with butternut squash, kale and spicy Italian sausage makes a crowd-pleasing elegant meal for Thanksgiving or any special occasion. I have a confession to make! I’ve never cooked a whole turkey and I really don’t know why, except maybe to say that I find it a little bit intimidating to cook a whole bird. I know…crazy right! 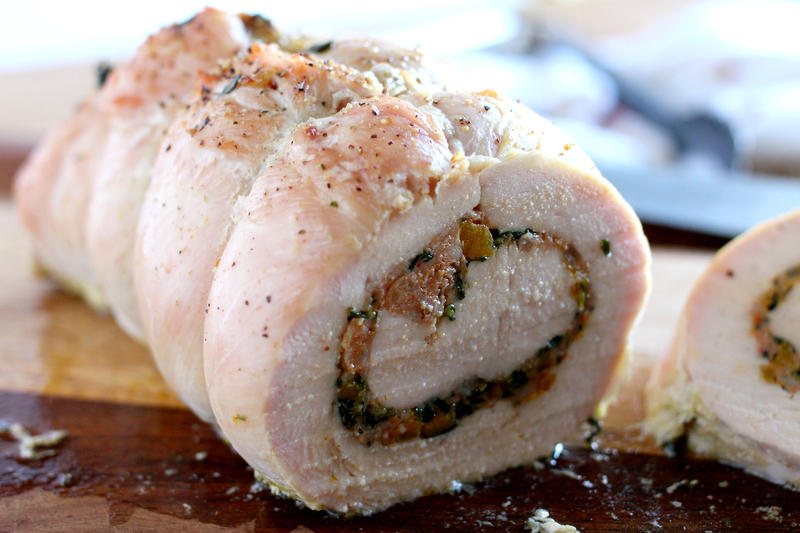 Mostly though, my family prefers white meat and if you do as well then you’ll appreciate how easy it actually is to make a turkey roulade such as this one. Aside from being far easier to prepare, it’s also much healthier and made even more so by omitting the skin. But, I’ll have you know that there is no skimping on flavor here. This delicious turkey roulade is packed full of nutrient dense vegetables such as kale and butternut squash and livened up with some spicy Italian sausage. For some aromatic allure I’ve added fragrant rosemary and sage to both the stuffing and the organic chicken broth. My intent was to make this recipe more of a step by step tutorial for beginners. However, daylight savings time had other plans for me. I was quickly losing some valuable natural lighting here. But at least I get to show you how a butterflied turkey breast looks like. Purchasing a deboned, skinless and butterflied turkey breast really simplifies the whole process. All I did was lay it out between two sheets of saran wrap and pounded the meat with a meat mallet to about 1/2 inch thickness. I then spread the stuffing onto the turkey breast to about 1 inch from the borders. Rolled it up…tied it up…and voila! 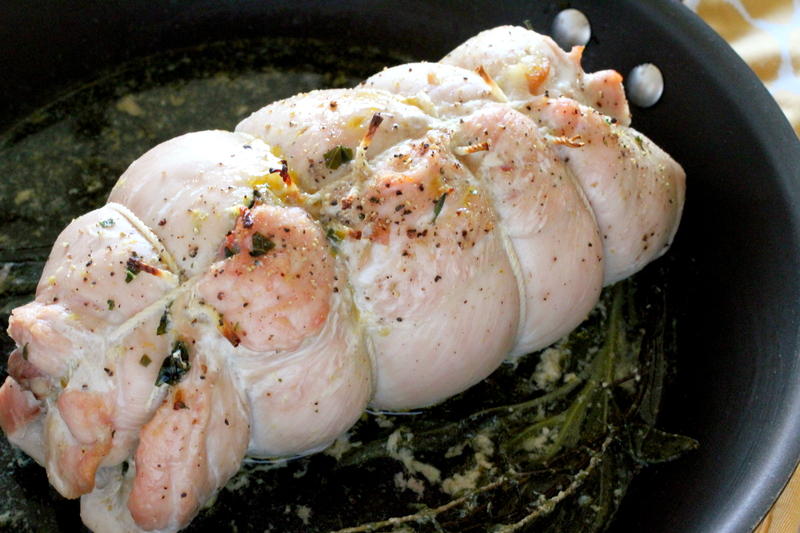 Here you have a succulent rolled up Easy Roasted Turkey Roulade! The key to having a moist and tender meat is to baste the turkey every 15 minutes with the chicken broth. You will be rewarded with a delicious, mouthwatering meal and will make you wish that you had doubled the recipe! 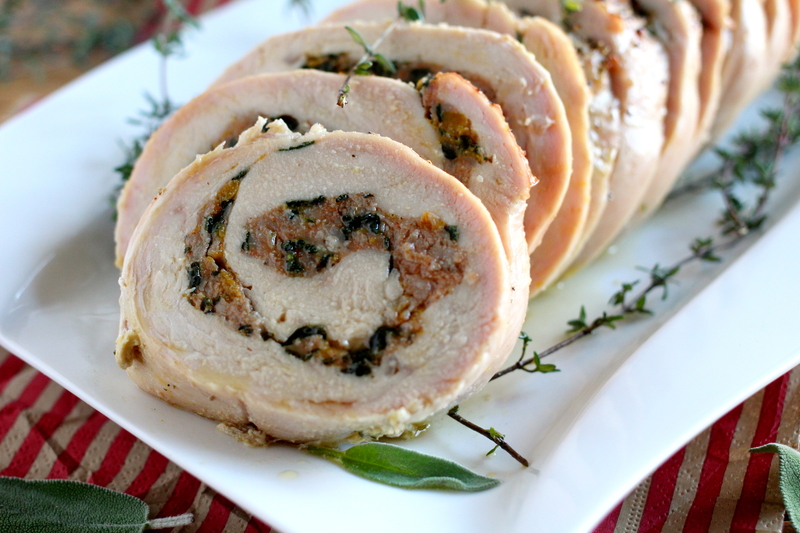 Easy Roasted Turkey Roulade with butternut squash, kale and spicy Italian sausage makes an elegant meal just perfect for any special occasion. Heat the olive oil in a large skillet and sauté the onions for a few minutes till the onions are soft. Add in the garlic, butternut quash, kale, the fresh sage, thyme and sprinkle with salt and pepper. Stir the vegetable mixture and continue to sauté for about 5 minutes or till the butternut squash is soft and the kale has wilted. Set aside while you prepare the turkey breast. Place the butterflied turkey breast between 2 sheets of saran wrap and pound the meat with a meat mallet to about a half inch thickness. Add the sausage to the vegetable mixture and stir very well until evenly combined, then spread this over the turkey breast to about one inch off the border. Starting at the shorter end, roll the turkey breast tightly together and tie with 4 equal pieces of butcher's twine at one inch intervals and one longer piece along the length of the stuffed turkey. Sprinkle the turkey breast lightly with salt and pepper. Pour in 3/4 cup of chicken broth into the pan with a few springs of fresh sage and thyme. Cook the turkey breast for about 1 hour and 10 minutes or until an instant-read digital thermometer reaches 155 degrees F.
Baste the stuffed turkey every 15 minutes with the remaining chicken broth so that the meat does not dry out and retains moisture. 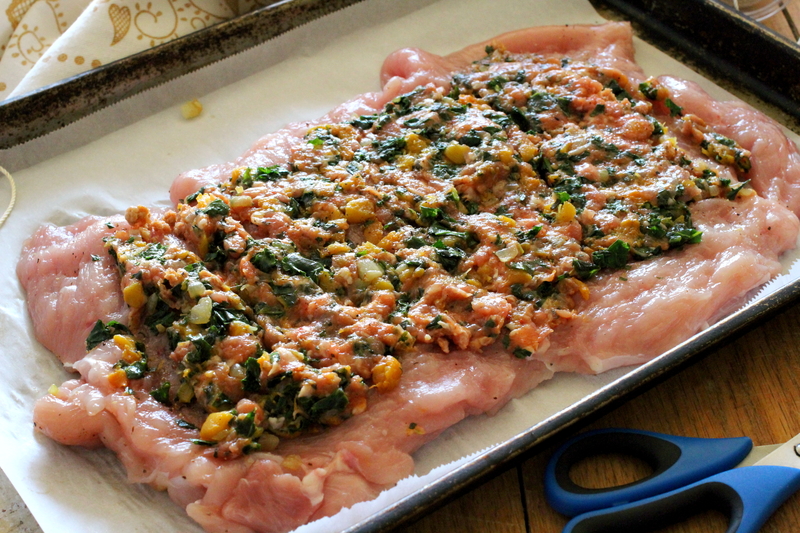 When ready, transfer the stuffed turkey breast onto a cutting board and slice into 3/4 inch slices. Place the slices onto a serving platter. Strain the pan juices through a fine sieve and pour the juices over the sliced turkey breast.